A stunning track! This is the best track for all time of existence of psychedelic trance! Goes without saying that all this would describe! Vimana is one of the best... if not the best track of Etnica EVER!! This is a piece of vinyl i hold dear!! The lead melody at 04.39 is imo truly "A alien piece of work". as they are the true leaders of this genre. As the sample says: "This visitor somehow explained the way aliens have been genetically altering the development of our DNA, from our very beginnings, and that they inspired our great spiritual leaders"... this is a Alien sent piece of music. Hopefully this one needs no introduction... In plain terms, these three tracks might as well be Etnica hitting their peak. But that is a tough call. This is 28 minutes of old school bliss like you've come to expect from these veterans, if not better. "Plastic" is just fantastic, a bit more downtempoish, but who said it had to be all about high BPM rates? 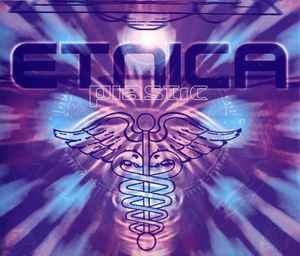 Etnica actually sounds more intense and energetic than 80% of other acts even when not delivering party monsters. "Vimana", well, is there anybody out there who yet hasn't heard of it. The track that defines this group. It is massive, from the initial sample to the closing beat. It's an old school classic others are measured against. The third track, "Floating Universe", not feautured on the 12" release the previous year, is not as known, but is most probably just as good. Just listen to that melody kicking in at 05:25... Danm, when did it get better? Justifiably so, in 2007, this CD maxi is considered a rarity, so if you get a chance to purchase it, do not hesitate. Ol' school flavor to the fullest.